Rick Rubin and Malcolm Gladwell's new podcast is already becoming a quick fan favorite, with the pair recruiting none other than Eminem for their inaugural episode. The podcast, titled Broken Record, launched this Friday (Nov. 10) with the near-15-minute episode unearthing all sorts of gems, especially surrounding Em's new collaborative track, "Walk on Water," which features Beyoncé. During the conversation, the three have a candid talk about the making of Eminem's new single, with Gladwell revealing that JAY-Z played an impactful role with the track's creation. Per Gladwell's reveal, which begins around the 8:40-minute mark, JAY-Z helped get Beyoncé to sing on the song's chorus after Rubin played him the track, while Bey was out of town. Hov liked it so much that the rest is now history. While it is still unclear if such a move took a lot of convincing or happened organically (Gladwell does point out Beyoncé also "liked" the song herself), it's safe to say the powerhouse collaboration definitely caught fans of both parties extremely off guard. Elsewhere throughout the podcast, topics range from how the veteran emcee can be "frustrated" with today's new wave of rappers to from Em's personal history with rap (with a nod to Tupac's abilities as an emcee) to how Rubin played Frank Zappa while in the beginning stages of working on the new track together, alongside Skylar Grey. 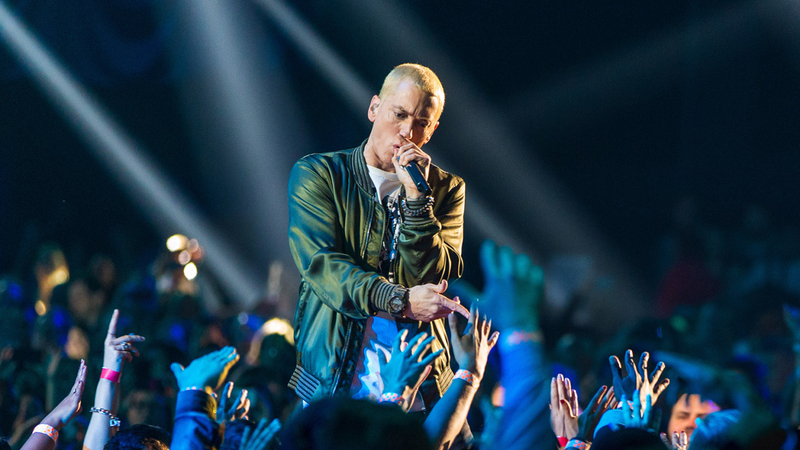 "People are always expecting something different from you," Eminem says, touching on some of his frustrations about his legacy at the beginning of the episode. "'I want him to talk about this, I want him to talk about that. I want him to just spit. I don't like when he just spits. He does too much rappity rappity s—t. I don't like when he self loathes, he does that s—t too much. I don't like when he puts all them syllables together but they don't mean anything. There's less places to go that you haven't already been.'" Needless to say, Eminem was especially candid during his appearance on the podcast, helping set the bar high for episodes to come. Take a listen to the first episode of Malcolm Gladwell and Rick Rubin's new podcast below. REVOLT IMO | The Most Influential Malcolm X Quote?